Incredible views from Living Room, Dining Room and Kitchen! Beautiful tri-level custom designed Oceanfront house with separate units, located on the water at beautiful Lyman's Bay just two miles south of Kailua Kona town. Penthouse Suite is 2BR / 2BA unit with fully equipped kitchen. Orchid Suite is also 2BR / 2BA unit with fully equipped kitchen (both sleep six). Studio Suite has full bedroom, dining area and kitchenette. 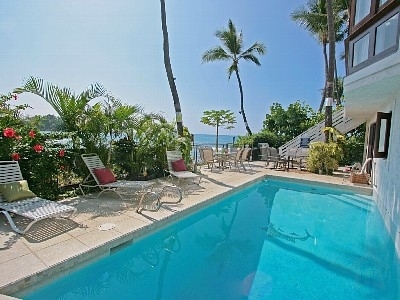 Direct ocean access plus private solar heated pool and spa tub just steps from ocean. Conveniently located between Kailua town (shopping, dining, nightlife) and Magic Sands Beach (swimming, bodysurfing) and Kahaluu Beach Park (Best snorkeling plus surfing). Swim With Turtles, But please Don\'t Touch Them. Relax under the sun on under the stars. Just 2 Miles From The Best Snorkeling.